Reducing costs by navigating your IT budget is perhaps one of the most challenging tasks for an organization. Getting the best out of IT investments takes a close second. Thus, every CIO is on the lookout for solutions to improve an organization's efficiency. Every organization has realized that IT plays a major role in ramping up their investments. If you are looking for effective ways to improve the operational efficiency and productivity of your sales team, ERP-CRM integration could be a good idea to consider. With the advent of cloud-based apps, today, it has become possible for even small/ mid-sized organizations to use Customer Relationship Management (CRM) and Enterprise Resource Planning (ERP) solutions in some form or the other. Cloud-based solutions are not just cost effective and easy to implement but also give organizations the flexibility to mix and match various tools and use them according to their specific business requirements. However, so far, many organizations have not yet considered the value of unifying their ERP and CRM solutions. While CRM centralizes marketing, sales pipeline, automated customer service, and creates visual reports, ERP systems can handle backend activities like accounting, purchase, collections, HR, etc. ERP and CRM solutions provide individual collections of information, and integrating the two will improve the operational management of an organisation. Integrating the two systems can remove data silos and increase productivity. The integration is inevitable, not because both the enterprise applications can be delivered on cloud - the cloud is only a delivery mechanism. Business scalability is the key concern when you are implementing cloud ERP. Besides, change management and user adoption are other key factors that a CIO has to consider. Keeping these in mind, there is an evident need for a unified platform that can track operations from lead generation to sales, and from sales to delivery, and at the same time, give a bigger picture of where the organization stands. Organizations are expanding at a rapid pace, and before you know it, you quickly get caught up in a complex IT landscape. Like most organizations, you start with a small and simple solution to manage book keeping. As you attain more customers, you start investing in more management systems that are meant to ease the process, like ERP, CRM, inventory management, order management, etc. You eventually expand geographically by opening more office locations, and end up embracing more sophisticated processes to support coordination, billing, managing sales channels, etc. This support comes from a variety of vendors and in-house applications. It doesn't take long before you realize the architecture was poorly planned and wasn't future-proof. This short-term approach affects your scalability in the long run and this tangled web of siloed systems suppresses your growth by holding back flexibility. It ultimately slows down the company's ability to grow. Increased Visibility and Improved Forecasting: If you have fragmented systems, you are likely to have multiple overlapping databases. It is not possible to get a view of business performance in a timely fashion. This makes organizations slow to take critical decisions based on inaccurate information. In other cases, they end up making hasty and risky decisions, going by gut instinct. 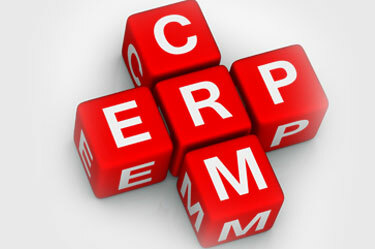 Integrating CRM with ERP can dramatically improve visibility, which in turn helps in making timely informed decisions. We have found that a most of the sellers do not have access to their ERP systems. This lack of access and information means that any hope for accurate forecasting can go out the window. If you integrate the two, ERP and CRM systems can give your team a real-time visibility into the business data. User-Driven Innovation: Apart from empowering employees with the right information at the right time, workflow management capabilities allow organizations to automate steps and processes that were previously manual. This significantly improves an employee's productivity. The ERP-CRM integration also gives room to enhance productivity by making dynamic changes to processes, which can be adopted with ease. This means that process changes can be implemented quickly. By allowing user-driven innovation and developing automated workflows that span both CRM and ERP applications, organizations can expand on individual capabilities of their ERP and CRM systems. Business users from your sales teams will be able to apply their functional expertise to customize processes and applications in a way that improves the organization's overall performance. It also creates a possibility of value addition to your core-offering to customers. Accelerated Growth: Valuable IT time that can be used to make business more productive is often wasted, while maintenance costs skyrocket. Businesses that have high-growth are overcome with making business decisions on choosing the best solution to manage its expanding operations. Lack of real-time visibility stops them from getting an overall picture of the current status. With an integrated software system, expansion to multiple locations and additional sales channel can be accomplished a lot faster. It acts like a detailed centralized data warehouse which gives a larger picture of all departments and their performance. A real time-overview of the sales report lets you analyse and forecast - at any time - how and where your business is likely to grow. Remember that the CRM and ERP are no replacement for each other, but the integration between these two systems is essential for easy collaboration between departments. The key to an efficient solution is creating two systems that are seamlessly integrated and designed in a user-friendly environment.